What he experienced that day wasn’t life-changing … It was life-making. Set in small-town Japan, this warm and mystical story is for the lucky few who have found their calling - and for the rest of us who are still searching. It shows that the road to finding one’s purpose is a winding path, often filled with treacherous doubts and, for those who persevere, astonishing moments of revelation. As a bookseller, when a book is recommended by other booksellers, my interest is automatically piqued. The Forest of Wool and Steel by Natsu Miyashita has sold over a million copies in Japan, in 2016 won their National Booksellers Award, was made into a film with music composed by Studio Ghibli and shares the same translator as the celebrated Haruki Murakami. What’s not to already love? The novel begins with the narrator, seventeen- year-old Tomura, being hypnotised by the sound of a single piano being tuned in his school gym for the first time. The experience is life-altering to Tomura, literally. The unexpected, seemingly everyday encounter transports him to the forest. His senses are heightened, he can feel the dampness of the forest underfoot, smell the earthly fragrance of the forest at nightfall and hear the rustling of the autumn leaves as they descend. Tomura instantly decides his vocation is to be a piano tuner. He asks the tuner, Mr Itadori, to take him on as an apprentice, however Itadori advises him to finish school and offers the details of a specialist piano tuning college on the mainland. After graduating Tomura embarks on the two-year course along with seven other students. From morning until night, he learns all that there is to know in the art of piano tuning. Upon completing his studies, Tomura returns to Mr Itadori and lands a job in the same establishment as Itadori, the Eto Music Shop, which employs four other piano tuners and a handful of sales and administrative staff. Under the tutelage of the other master piano tuners, Tomura embarks on his quest for perfection, constantly asking himself the unfathomable question ‘Do I have what it takes?’. However, Tomura is overwhelmed by crippling self-doubt and the difficulty of his chosen profession, and feels that mastering the craft of piano tuning and achieving the sounds that Itadori and the other tuners are able to produce is beyond him. While this is definitely a coming-of-age novel centred on the main character Tomura, it is the other characters, the master piano tuners, the colleagues in the music shop and in particular the captivating twin-sister clients of Kazune and Yuni that provide a lightness to the story and a balance to the obsessive nature of Tomura. And, of course, the forest is ever present. 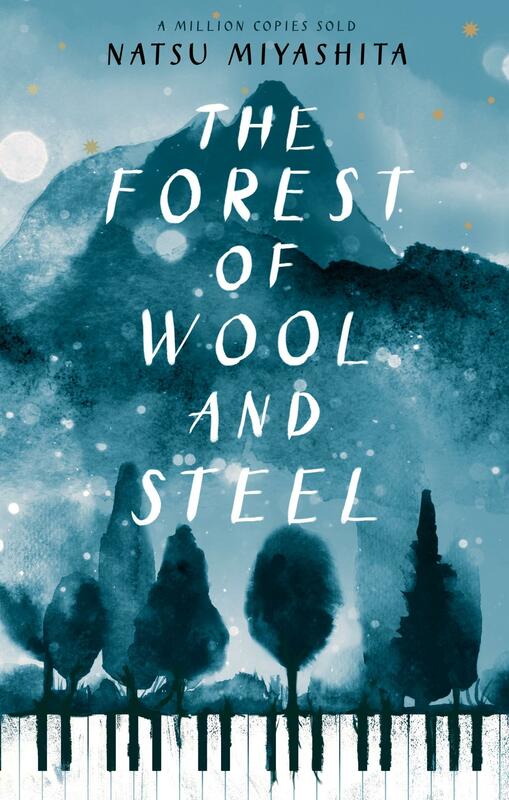 It is easy to understand why The Forest of Wool and Steel has been such a hit in Japan; it’s a beautiful and totally immersive work of fiction. The elaborate descriptions of the piano-tuning process have an almost ethereal quality. The meandering pace and the disconnection the reader feels from today’s fast-paced world for the search of perfection through sound and nature will strike a chord with many. Danielle Mirabella is a book buyer at Readings Hawthorn.